A few blissful days relaxing on the Mediterranean is great way to experience some of the Turkish coast and ancient Lycia. Lie back beneath a blue sky, as you enjoy the opulence of a chartered sailing experience. Let a full crew service your needs. Sleep in a hotel room with an ever changing sea‐view. Eat delicious freshly caught fish, grilled with bay leaves handpicked from along the shore and imagine you’re Odysseus on the journey of a lifetime. Take to the water on a traditional wooden Gulet. These two masted, old‐world sailing vessels take you back in time to mythical sea journeys, except with modern day conveniences and crew. Tailored Gulet cruises carry you away to the most exquisite secluded bays, coves and golden beaches of Turkey’s spectacular coastline. You’ll dock in bustling harbours and secluded inlets along the way, wending through the treasures of Turkey’s historical and cultural sites. Select from our selection of cabin charter gulet cruises below. Enjoy the romance and adventure of taking a journey through the idyllic seas. A perfect trip for a couple or the whole family. Simply drift through the waters or snorkel, fish, water ski and explore the coastline’s natural and historic sites. 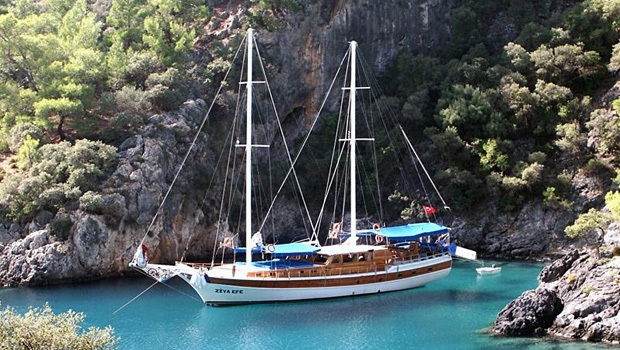 Select your dream gulet for your private cruise.